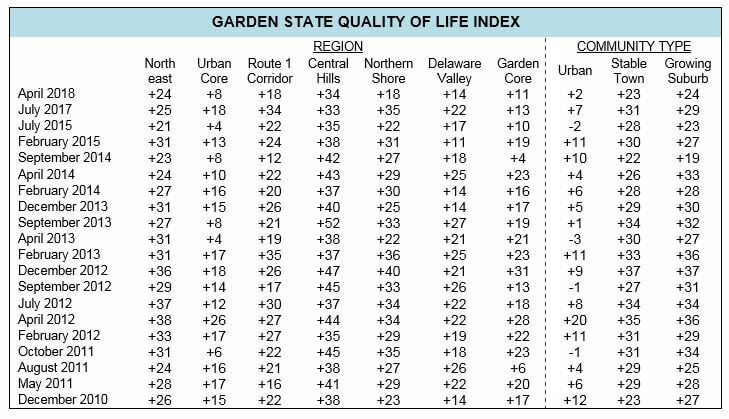 West Long Branch, NJ – New Jerseyans’ views of their home state quality of life have dropped, due in part by a record low rating for the state as a place to live according to polling going back to 1980. 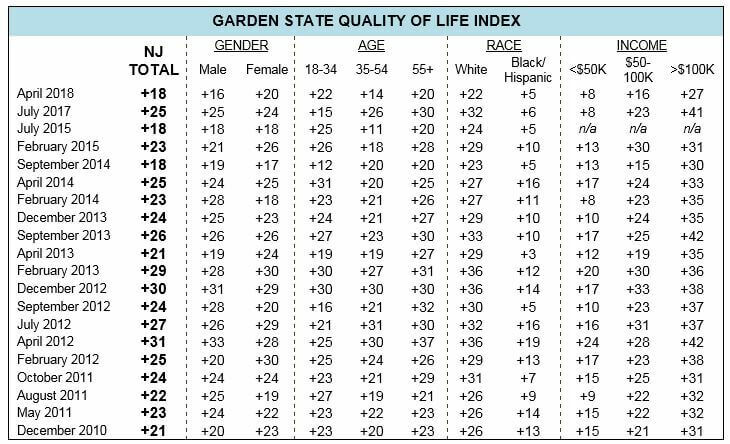 The Monmouth University Poll finds that opinion of local communities has not dropped by as much, which has kept the Garden State Quality of Life Index score from completely tanking. The state issue that aggravates New Jerseyans the most is the highest-in-the-nation property tax burden, which has been at the top of the list of public grievances for the better part of a decade. 32. How would you rate your town or city as a place to live – excellent, good, only fair, or poor? 33. How would you rate the quality of the environment in the area where you live – excellent, good, only fair, or poor? 34. How would you rate the job your local schools are doing – excellent, good, only fair, or poor? 35. How safe do you feel in your neighborhood at night – very safe, somewhat safe, or not at all safe? Note: All trend results prior to 2005 come from Rutgers University’s Eagleton Poll. Region in this report is defined by county boundaries: Northeast (Bergen, Passaic), Urban Core (Essex, Hudson), Route 1 Corridor (Mercer, Middlesex, Union), Central Hills (Hunterdon, Morris, Somerset), Northern Shore (Monmouth, Ocean), Delaware Valley (Burlington, Camden, Gloucester), and Garden Core (Atlantic, Cape May, Cumberland, Salem, Sussex, Warren).